Amid criticism and increasing tensions with the west, Iran’s Mahmoud Ahmadinejad has taken a Latin American tour of Venezuela, Nicaragua, Ecuador and Cuba, where the Iranian leader gave a key lecture, met with President Raul Castro and his brother Fidel, addressed bilateral cooperation relations and corroborated Havana´s support of his nuclear energy program. Ahmadinejad visits Cuba as part of a controversial Latin American Tour. The newly announced European Union oil embargo on Iran, Tehran’s decision to go ahead with its nuclear program (which it claims to be a peaceful energy project), its decision to close the strait of Hormuz, the recent Iranian military exercises and the killing on January 10th of the fourth Iranian nuclear scientist, are major factors that have seasoned the environment of Ahmadinejad’s trip. In this context, Mahmoud Ahmadinejad headed for Venezuela, where he signed a series of cooperation agreements. Later, he attended the swearing-in ceremony for Nicaragua’s Daniel Ortega and arrived in Cuba on Wednesday morning. After being received by Cuban Vice-president Esteban Lazo, Ahmadinejad left the Jose Martí International airport without giving any statements to the press. Later he reappeared, as stipulated by the announced schedule, at the main hall of the Havana University where he was granted a Honoris Causa Doctorate in Political Sciences. 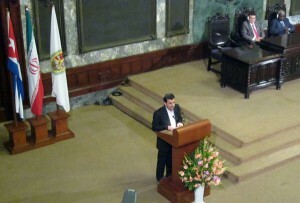 In his lecture, attended by Vice-president Esteban Lazo, the University Rector, personalities in the academic world, professors, diplomats, government officials and students, the Iranian president focused on what he described as crucial factors for human beings to reach peace and happiness, such as justice and love for the others. He criticised capitalism for having missed these values and demanded what he called a fairer world order. This was the first activity that found international media repercussion. 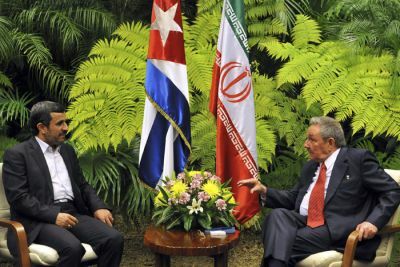 ‎Later in the evening, Ahmadinejad held official talks with President Raul Castro. The official press said that “the two leaders exchanged views on the excellent state of bilateral relations and international issues. And that they had ratified their countries’ commitment to defending peace, to international law and the UN Charter and to the rights of all states to use nuclear energy with peaceful means. They also reaffirmed their opposition to unilateral economic sanctions,” the paper said in direct reference to Havana’s support of Iran’s nuclear energy program and Iran’s position against the US economic, financial and commercial restrictions on Cuba, known as the American embargo. Ahmadinejad’s last activity in Cuba was his meeting with former Cuban President Fidel Castro. He told reporters that bilateral relations between Havana and Tehran are excellent. On Thursday morning, the Iranian head of state left Cuba for Ecuador where he will meet with President Rafael Correal. Ahmadinejad was seen off at Havana’s Jose Martí International Airport by his host Raul Castro.